While E! is celebrating the success of its hit new reality show Total Divas, former WWE star and TNA Knockout Kharma is set to become a Double Diva! Kharma, real name Kia Stevens, is set to appear on an episode of Lifetime’s reality show Double Divas, which recently began airing its second season. The show follows lingerie shop owners Molly Hopkins and Cynthia Richards as they run their LiviRae Lingerie store in Kennesaw, Georgia. Thank you to everyone at LiviRae and the cast & crew of 'Double Divas' for helping me find under gear that'll keep my puppies in check! I'll keep you all posted on the air date of my tv appearance for @DoubleDivasTV on Lifetime. It was a crack up! 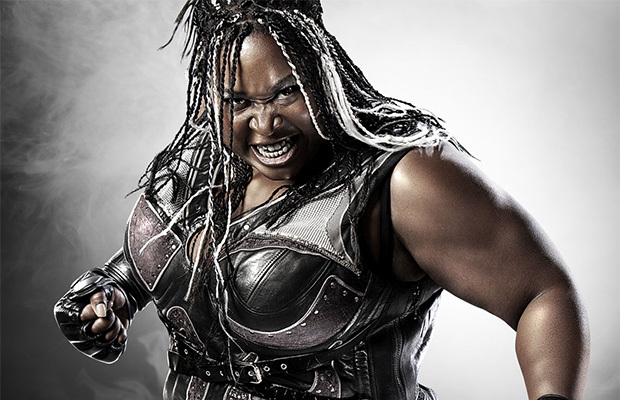 We’ll keep you posted on when Kharma’s episode of Double Divas will air. If her tweets are to be believed, it will surely be worth a watch!